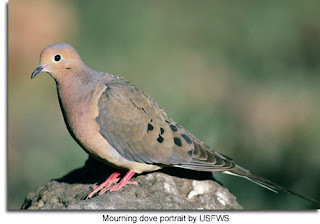 Mourning Doves are common where we live. These docile creatures are often found perched daintily on tree branches, telephone wires, and fences. They produce a soothing cooing sound that some mistake for an owl, and some obviously view as a sorrowful or lamenting sound, thus their name Mourning Dove. I associate their sounds with my childhood, a time of innocence, as I'd hear them cooing in the morning or evening around our home. Their feathering is soft and smooth, and their coloring provides them with some degree of camouflage that protects them from predators. They are mostly vegetarian, with 99% of their diet coming from seeds and grain. Christ told His disciples to also be harmless doves. Serpents and doves almost seem opposites. The Greek word for harmless, ak-er'-ah-yos, means “unmixed,” and refers to things that are 100% pure or undefiled, such as pure metals like gold or unmixed wines. Throughout the New Testament, this term is also used to imply moral purity and integrity as well as the mind being without a mixture of evil, free from guile, innocent, and simple. In the ancient world of the Old and New Testaments, the dove was symbolic of purity, faithfulness, and guilelessness. The dove was also the only bird that could be offered as an acceptable sacrifice under Old Testament law. The descent of the Holy Ghost upon Christ following His baptism by John took the symbolical form of a dove. To be “harmless as doves” means that those who follow Jesus as His disciples, must be above reproach in both conduct and speech. We must be sharp, clever, patient, and somewhat shrewd in our dealings (as serpents) with our cunning (wolf-like) adversaries, but we must never stoop to their ethics or tactics. We must be free from guile and evil. Sin in the actions or words of a purported follower of Christ gives his foes an easy place to discredit and neutralize his witness. Therefore, to be as harmless as doves means to be meek, innocent, and pure throughout; without dual purposes, deceit, or corruption within our hearts. Jesus was as pure as a dove. He was without guile. He could ask of his enemies “Which of you convinceth me of sin?” (John 8:46) and they were speechless. Those who hated him could never find any real or meaningful accusation from the conduct in Christ's life with which to discredit him. The only place they could truly attack him was in his teachings, or to falsely charge him that he broke the law by doing good or that he performed miracles through the power of Satan. Because of his pure life, he forced his enemies to focus on his teachings, and his doctrine or the interpretation of the doctrines of the day, as the focus of debate. This is what Christ wanted and this is what lead to his ultimate condemnation to death by the Jewish leadership and those that followed them. To be as harmless doves, we must avoid anger and be without the gall of bitterness and revenge. As the dove is without gall, we should be without guile and not deceive...as Nathaniel in whose spirit there was no guile (John 1:47). This is innocence. This is being like a little child. We should be without fraud and craftiness. We must be mild, even praying for our enemies as we are commanded to do. We must be humble. Unfortunately, we live in a time where there are more wolves than doves. People are full of guile and many study nothing but deceit, "They speak vanity every one with his neighbour: with flattering lips and with a double heart do they speak" (Psalm 12:2). Doves have no horns, claws, or sharp talons to defend themselves. They really cannot hurt other beings. Their only defense is to fly away when danger approaches. Doves can fly quickly, up to 55 mph. When a predator approaches, they may also perform a nest-distraction display, or a broken-wing display, fluttering on the ground as if injured, but then fly away when the predator approaches. We too, should flee before an enemy that would guarantee our destruction. We should not harm others or deceive them. We should seek for purity and innocence, through constant repentance and humbling ourselves before the Lord.